Upon entering the dungeon, you will see a floating temple from afar but the path that leads the way is broken. You will meet Velik’s High Priestess, telling you that Goddess Velik is in trouble. They will summon a pegasus for you to fly to the temple, in hopes of saving Goddess Velik. Just like Darkan from the past dungeon, Sky Cruiser Endeavor, he still has the same basic attack patterns. However, few special attacks are slightly altered. Once you initiate combat, fire will spread around the edges of the room, forming a ring, and “Lesser Mana Generators” will also appear. Left or Right – The most basic attack. He will attack the person with primary aggro with his Left or Right sword. It doesn’t hurt much, but if you keep getting hit damage will add up pretty quickly. Back Spin – Darkan will swipe his back as he spin around, inflicting Bleed debuff. This can be potentially dangerous for melee class. This attack usually follows after he does a Right>LEFT sword combo, however he may do this with no preceding attacks(rare). Eviscerate – Darkan’s 2-hit combo. He will quickly strike down his glowing swords that shoot a blast wave, then immediately follow up with another blast wave; tanks must make sure they block against this attack. This attack inflicts bleed debuff on the 2nd hit, which can mean trouble for tanks as the damage from this attack alone hurts quite a bit. He may target a random party member with this attack, and the blast wave has a long range so caution is needed. Drill – He will charge toward the person with aggro like a drill, hitting multiple times if you don’t avoid it. DPS should be careful behind him as his wings will deal damage if they are too close. This can be forced to trigger when the person with aggro is far away. With the 5 types of his attack patterns above, he will attack toward the person with aggro in a combo. However, you can easily tell what he’ll do just by looking at which sword he uses. Left Sword: Left – Right – Left – Right (Pause) Left Swipe. Claw – This can be either Random target or Res bait. He will face the target and throw his swords, creating a huge claw mark on the floor. His sword inflicts Bleed debuff on the return, while the claws on the floor are DoT (Damage over Time) until they disappear. Triples – He will Swipe three times as he shouts “Fools, all of you!”, “You’ll die here!”, and “I AM INVINCIBLE!”. There is no static order of his swipes as they are completely random. Instead of focusing on the person with aggro, he will select one random target on every speech bubble “Fools, all of you!”, “You’ll die here!”, and “I AM INVINCIBLE!” for the swipes. The random targeting is completely random, so it can target same person more than once. Pro Tip: You can use Warp Barrier or Smoke Bomb to avoid this. However, it seems like there’s no way to tell the difference in which pattern may come up first. It is strongly advised to stand around ~7m away from Darkan during this attack. This attack inflicts 100k damage. This cannot be iframed nor blocked. Dark Heart – Darkan will glow purple, stab his swords on the ground ,curl up, then roar, blasting a wave that inflicts damage, silence and bleed debuffs. Healers should try to prepare their cleanse just incase. Anyone hit should be careful as he may follow up with a attack quickly. This is much faster than it was in Sky Cruiser Endeavor. Silence can be blocked, but you will still receive damage. This mechanic is simple, but it may require a bit more cooperation from the party. Fire Spreads – When you initiate the combat, a message appeared saying that fire is spreading. After a moment, the combat area will be surrounded by a Ring of Fire. Fire ring inflicts 50k damage per tick. When the ring of fire appears, you will also notice the Lesser Magic Generators. However, if Darkan’s HP falls below 50%, the Lesser Generators will be replaced by Greater Generators and Ring of Fire will reset. These generators are the key to avoiding Darkan’s special mechanic “Dust”. During the “Annihilation” the targeted person (or everyone when Darkan’s HP is below 50%) will have an AoE indicator under them. They must place the AoE so that it also hits the Generator to break it. Breaking these generators will clear up the Fire around its surrounding, allowing your party members to safely avoid “Dust”. Annihilation – Break the pylons with this attack so that it creates a safe zone for next attack. Above 50% HP – Prepare to suffer! – One person will be targeted for massive damage. Below 50% HP – If you stand together, you can die together! – Everyone will be targeted for massive damage. Again, BREAK A GENERATOR. See picture example below. One shot if failed to dodge. Cannot be blocked, but can be iframed. Once these pylons are destroyed, they will reappear few moments after Darkan nukes the inner area with Dust. The Annihilation and Dust aren’t any different. However, the generator part is slightly altered. They start as Lesser generators. However, when it is replaced after it was destroyed, a Greater generator will be summoned instead. When Greater is destroyed, it will be replaced by an invincible generator. Invincible Pylon = Invincible. It will have a blue shield. Dust – Unlike what he did in Sky Cruiser Endeavor, he will cover almost entire area with a one-shot AoE. If you and/or your party successfully broke pylons from Annihilation Mechanic, there will be a safe zone to avoid this massive AoE attack. However, in case the party failed, you can attempt to time your iframe/movement skills to move into the fire then quickly move out of it after Darkan blasts the area. Be careful when Darkan’s HP is near 50% after Nuking mechanic. When Darkan’s HP falls below 50%, the pylons will be replaced to “Greater Pylons”, resetting the fire ring as well. So if Darkan proceeds to Dust mechanic, your party may have to risk death by moving in and out of fire ring quickly at the right time to avoid the one-shot. As you can see, you can’t use smoke bomb to avoid Dust. Dakuryon from Shadow Sanguinary is back, but this time, he has attack patterns/ mechanics from both Dakuryon and Imperator together. There are a few minor tweaks from the last time you fought him. Some people have different methods to tell the difference(s) for the following. I am writing this guide based on how I tell the difference, but I will also mention the alternative methods. Stab – There are three different patterns to this. Stab and Toss – He will randomly target (usually someone who has been “Retargeted”), stab, and throw that target across the room. This isn’t much of a threat, but it may result in DPS loss. You can iframe this with proper timing. Thrust and Knockback Swing– He will thrust his spear forward then swing his spear while spinning that knocks back across the room. This attack can hurt quite a bit. This may sometimes be preceded by a backwards teleport. Left or Right – His most basic attack will be a simple swinging motion with his spear to strike down toward the person with aggro. He will do a combination of Swipes and Slams. You can also look at the hilt (bottom part of the spear) position to see which side is the safe side for the swipes, but you will have to react to his smash attacks. You don’t have to memorize these sequences as you have enough time to react to it. The Swipes will knock you across the map and inflict a bleed debuff. The Slams inflict heavy damage. Both Swipes and Smashes can be fatal. Left: He will twirl his spear from his right side and strike down. He will be standing straight with his left foot behind. Left Swipe – He will pause very briefly while the spear glows and swipe 180º to his left. Back Slam – He will turn around to slam the area behind him. This cannot be blocked, but can be iframed. Right: He will swing his spear above his head and strike down. He will not be standing straight with his right foot behind. Right Swipe – He will pause very briefly while the spear glows and swipe 180º to his right. Front Slam – He will lift his spear back up immediately and makes a large motion before he slams his spear down. This cannot be blocked, but can be iframed. Front Smash – Right Swipe – Left Swipe – Back Smash. Purple Balls – After he reaches certain amount of HP, purple balls as shown below begin to appear in the map. They will circle around the map throughout the entire fight and will not disappear until Dakuryon is defeated. When you come in contact with these balls, they will inflict flat damage after few seconds. They can be fatal when the fight ends up being chaotic. When there are 4 of these balls floating around, Dakuryon will says “BOOM!”. Then, these balls will create a yellow AoE around 15m radius, and detonate. I wouldn’t try blocking (couldn’t find info whether it can be blocked or not). Retargeting – Unlike Shadow Sanguinary, there will not be a notification for this. However, retargeting always occur after Dakuryon strikes down his spear on the ground twice, which has a vacuum (pull) effect on the first hit. The target debuff does nothing when a party member only takes it once, but when taken twice, they will be stunned and Imperator will leap towards him/her, stab and smash on the ground multiple times before throwing toward the farthest party member. When you are targeted for the throw, it can be iframed if timed correctly. Then he will immediately follow up with an AoE under everyone, which can be iframed. However, try to avoid overlapping them with others as it is very dangerous. The timing to avoid it using iframe is to look at the pulse on the AoE. It will detonate just before the second pulse reaches the end. Protip: Healers can do some amazing tricks against this attack. Priest can save the targeted person if they time their Divine Intervention correctly, just before the person gets stunned. Mystics can safely get stabbed and hurled around if they use Corruption Ring until Imperator leaps toward them. However, both methods will not save the person being targeted for hurl, so they must iframe the throw. However, if Divine Intervention is timed perfectly, it can skip the stab and hurl mechanic. Double Circle AoE – He will sometimes randomly target someone and place a stationary Circle AoE, then put another AoE under the same target that follows them underneath. The second AoE can be iframed when the explosion effect of the first AoE begins to disappear. He will also do this toward someone that’s very far away, or when healers cast Resurrection (known as res bait). Protip: Here are some tips for few classes are able to tank the second circle AoE after avoiding first one. Priest can use Kaia’s Shield to absorb damage and Guardian Sanctuary to mitigate ranged attack. These AoE’s count as ranged attack. This way, Kaia’s Shield will absorb a portion of reduced damage by Guardian Sanctuary. Mystic’s corruption ring has damage mitigation effect, which makes them quite tanky. Lancer can pop an Iron Will to absorb damage and immediately cast Onslaught for damage mitigation. This way, the damage will be halved and your Iron Will absorb a portion of that halved damage. Brawler’s Bullrush has a damage mitigation effect that halves damage. Valkyrie’s Balder’s Tears reduces damage by 70% for 3 hits. Lakan’s Authority – This is the same as gathering energy buff he gets in Shadow Sanguinary, increasing his Power and Attack Speed. Shield Phase – When his HP falls below a certain amount, the person with the aggro must run as far away from Imperator as possible. The targeted person will have an eye above their head as shown in image on right (bad quality but you can see the eye mark). That person will be stunned, and Dakuryon will run toward him/her while having a shield. If the party fails to break the shield, Imperator will stab the stunned person and throw him/her to the farthest person. If succeeding in breaking the shield, Dakuryon won’t do anything after he reaches his target. Whether you succeed in breaking shield or not, he will target everyone with an AoE, which can be iframed. Again, try to avoid overlapping them with others as it is very dangerous. The timing to avoid it using iframe is to look at the pulse on the AoE. It will detonate just before the second pulse reaches the end. After a short while, pizza slices will flash around the map. You will notice that one of them is blue, which indicates safe zone. However, there will be circle AoE around Imperator so do not run near him immediately. Then there will be another flashes of pizza slices around the map, so look for blue slice for safe zone. Hard Mode: Due to its popularity, blue pizza slices are sold out! Instead, you only have an option to die from red pizza slices, or starve for survival. Stand on the blank slice! Multiple AoE Patterns – Dakuryon will run to the center of map and shout “Dark mana explosion! !” In few moments, there will be multiple AoE placed around the map. Mobs – He will summon mobs around the map as he swings around his spear. If you don’t kill these mobs, they will turn into Cursed Archdevans that shoot red balls intermittently, so eliminate them. Unlike purple balls, the red balls disappear when you come in contact, but they can inflict heavy to fatal damage. Cage – During cage, instead of dodging the orange patterns immediately, just focus on memorizing them first; it won’t harm you at all. However, as soon as the 5th pattern ends, the purple pattern will appear in the exact same order as the orange pattern, and this is the one that kills you. Assuming that bottom of the star is the front, you will see blue arrows like the picture above when the AoE is Blue. These blue arrow will help indicate how the patterns will appear. However, the the red highlighted sector is something I’ve added for visual purposes. I will call these sectors Big Slices. Red indicators are harmless; memorize the pattern instead. These Purple patterns are dangerous — avoid them. No change to the patterns but there is Curse Mechanic. You will notice a small blue text in the middle of your screen saying “Sanguine Curse Affects your abilities”. This text can appear 1~4 times, indication how many stacks of these you have. You will also see small red skull debuff on your buff bar, with small number indicating how many stacks you have. If you have these stacks of curse, you MUST TAKE HIT from the purple patterns. This image on the right indicates the number of hits you will receive if you just stand there. The dots mean you have to stand on the lines where the patterns overlap. 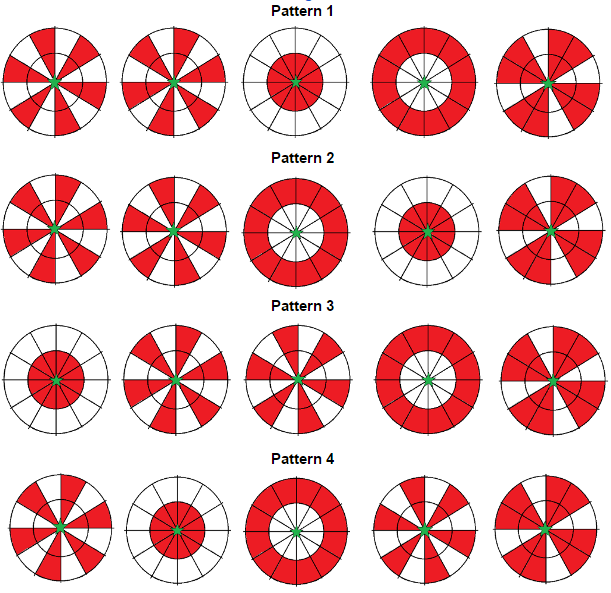 Also note that this only shows 2 parts where your party should be most of the time, but the pattern can be easily recognized if you study the patterns shown above. Here, you can choose to either (A) fight Perimos along with a few Archdevan mobs, or (B) fight many Archdevan mobs while skipping Perimos. For Hard Mode, option (B) will be much quicker. Pay attention when you’re fighting against Perimos. There aren’t much notable attack patterns as they aren’t much of a threat, so just try to defeat him as you’d normally do. Alternatively, you can also choose to go through a side path on the left, just before the stairs that lead to Perimos. Going this path will allow you to skip fighting Perimos, and instead fight a handful of Archdevan mobs. Clear these, and then there will be more mobs at the top of a staircase. Clearing all these mobs here will summon a teleportal that leads to the Final Boss. After Shandra Manaya has failed to create the bridge toward Agaia to free Manahan, another celestial decided to step in and free Manahan. Behold, the mastermind behind the chaos related to Archdevans, Northern Arun, and the plans to free Manahan from the Agaia– Lakan, the God of Avarice. This guy is packed with quite a bit of patterns. It may seem overwhelming at first, but it is very easy to read; however, once your party fall into chaos, this dungeon shows no mercy. This guy has multiple Basic Attack patterns. On the third part when he swings his sword from right to left, he will pause very briefly before he backspins like Darkan, but this time, there will be a large cone attack. There will be a very short pause again before he stabs toward the person with aggro. On the third part, he will swing his sword to form an X shape starting with Left diagonal slash then Right. Then he will lift his shield and slam it upright on the ground, creating small AoE that stuns anyone near him, then he will immediately follow up with a back kick that covers large cone AoE behind him. On the third part, he will swing his sword to form an X shape starting with Right diagonal slash then Left. Not much of a threat to anyone behind him, but if you are in front of him as DPS or Healer, you might be at risk from the last Shield attack as it covers a large cone AoE in front. 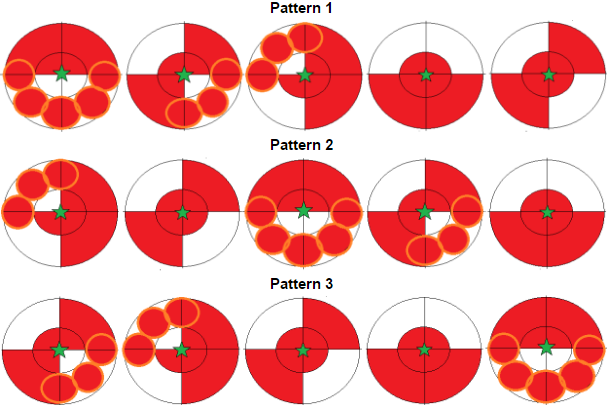 Instead of a Large frontal Cone on last hit with Shield, it will cause 5 wave AoE, starting with 10m radius circle, then 10~20m donut, 20~30 donut, 30~40 donut and 40~50 donut. When you get hit by this, your character will sky rocket and stay airborne for a while. You are knocked airborne and cannot do anything but to wait until you land, so if you’re unlucky, this might get hit by other attacks and just die with no chance to do anything about it. When he strikes his shield it does nothing, but it tells you that he will start slashing like a maniac. The Stab does hurt though. He just pauses shortly and turns around to face random target. This occurs mostly due to res bait. He makes a large swing as he turns around, then faces toward random target. To add, this tends to target farthest person who is within ~17m radius. However, if the farthest person is outside of that ~17m range, it will target second farthest person, and so on. Therefore, it is best if healer can stay within 16m away from the boss while DPS stay closer to the boss. His shield glows pink and attacks by thrusting his shield forward. He will pause briefly as the shield’s glow is concentrated and shoots a laser. Then he will make a large swing as he turns around, then face toward random target. If you are targeted as random target with secondary aggro (purple ring under you), wait for Lakan to face you with his shield. Then, when you see his eyes flash, use iframe or mobility skill to move to safe spot in between the claw mark. If one of these conditions happens to occur, healers can prevent this with res bait so that it forces Lakan to pause and perform claw attack. Pro TIP: When the quote appears, you can use mobility skills such as backstep, fiery escape, teleport jaunt, etc, to get under Lakan to avoid this mechanic, but it isn’t recommended if you have no idea what this means. Make sure you are completely inside because if your character is touching the circles where the projectiles are fired, you will receive damage. Hard Mode: Hits harder than a Apache helicopter. Getting hit by this grants a free ticket to Hell. With a large sword swing motion, he will spin around with either Red or Purple swipe surrounding him. He will place a Circle AoE (~8m); stay away from him. He will place Donut AoE (8m~20m? ); hug him. What Perimos said is basically hinting to us the order of the pattern for this mechanic. However, if you don’t remember what Perimos said, a system message will pop up anyways when your party initiates starts combat. After 40 seconds of combat, Lakan will float and say: “I mark you!”. He will do this mechanic every 1 minute unless he says “I am no mere mortal foe!”. This means that he is forcefully resetting the 1 minute timer for the mechanic to trigger and follow up with “I mark you!” soon, but not necessarily immediately as he might still be doing a basic attack combo. It seems to be randomly triggered. But we’re just getting started. When Lakan’s HP falls below 50%, a system message will appear again, but the order of the Chaos Mechanic pattern will now be REVERSED. Note: Keep in mind that this message will be randomized! Tanks and Melee DPS: DO NOT go near him after avoiding the ring. Lakan will place a deadly puddle, and there’s high chance you will not survive. Let him come back down, and the puddle will no longer be there. Inflicts 100k damage per tick. Healers: When this 5 second buff timer icon (see image on right) appears, healers must use their dispell skill to prevent Lakan from creating a shield. Don’t worry too much though if the healer failed to remove the buff to prevent Lakan from forming a shield, since eventually it will break. In Hard Mode, your party will enter Lakan’s Soul World when his HP falls below 90%; however, you got an additional thing to worry about: the Soul Saturation Gauge. Whenever Lakan initiates Soul World, this gauge will fill up by 20 each time. Also, he will UNDO the Soul World as well during the fight, alternating between two worlds (normal and soul) around every 90 seconds or so. Also, Lakan will also UNDO soul world with the quote: “Ha! Not bad!”. This time, you must SLEEP (not plague/regress) Lakan. Priest can use Ishara’s Lullaby. Mystics can use Sonorous Dreams. When Lakan UNDO this Soul Invitation, the Soul Intrusion Gauge will NOT fill up, but unlike generating a shield during the Soul Invitation, if you failed to sleep him, he will nuke the entire map and cause a wipe. Translating, observing, and compiling KTERA guides and videos to original draft. Revision, correction, and refining memes. Revision, quality check, and formatting, as well as uploading to Essential Mana. I have terminal aids now. Discussions on forums, discord, or streams, also providing motivation to work on documents. Updated Chaos Key Mechanics (Names and Icons) for clarity. Member of TERA NA's Player Council, Translator of KTERA information, and a casual player on Tempest Reach, with Lancer main, Loriri. Too much to memorize even after updating; to make it simple keep in mind 2 patterns. Depending what you start your mechanic with Spread/ Gather/ Debuff can easily be memorized with keywords. I would like to ask since I didn’t have the chance to play it or check it out. Does the same souls repeat, meaning can you have curse twice in a row going below 50% from a curse since you say the messages are random. Also, your the cheos order illustration shows something different from what you typed.